On the first day of the Western Conference play-offs, three of the four host teams capitalized on the home advantage they had earned with their final standings in the regular championship, but only undisputed leaders Lokomotiv managed to win inside 60 minutes. 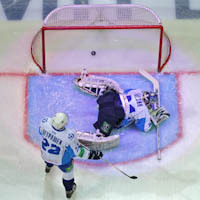 The final score of this game is no more than one would expect when the conference leaders host the team which finished 8th, but the Yaroslavl fans had to endure an agonizing spell in the second period when they saw their heroes’ seemingly unassailable winning margin reduced from four goals to just one. But in the deciding period Vladimír Vůjtek’s men regrouped and finally dispelled any doubts about their superiority over the visitors. A sign of the drama in this game was that both coaches felt the need to substitute the goaltenders. - We started the game by handing them a big present for the Army Day, gifting them a 5-1 lead with 22 minutes gone, - said the visitors’ coach Marek Sykora, with heavy irony, - but then we showed our character, turned the game around, and we had some really good opportunities to level the score. I’ve watched video replays of the goals Mezin allowed, and I’m not blaming him in any way. But five is too many goals for our main goalie, and I decided to make the change so as not to damage him psychologically. - Kotschnew allowed three quick goals, so I had to take him off. I couldn’t risk him letting even more in. We changed our game in the third period, and several times Vyukhin came to our rescue. That sixth goal from Kalyanin really helped, and I’m happy to have won such a tough game. - Our mood couldn’t have been better. We started really well but when the score is 5-1, obviously, you get it into your head that the game is already won. So we relaxed, and our opponents felt this. On top of this, we lost players through unnecessary penalties right at the turning point of the game. We have only ourselves to blame, but it’s great that we went on to win. After we started allowing goal after goal the nerves appeared, but for most of the game things went our way. Before the third period Vůjtek told us to start the game anew, as if at 0-0, and that’s what we did. It’s good to score a lot of goals, we’re attacking really well, but we need to focus even more on our defense. The fault doesn’t just lie with the defense and the goalie, the attackers are guilty too. Today it was only our forwards sent to the penalty box, and this put huge pressure on our defense. - The coach warned us that it would not be easy against Lokomotiv, and we must try to grab Game 1 with both hands. We tried, but not everything went our way at the start. We can’t blame Mezin alone, and not at all for some of the goals, but that’s what happened. Sikora told us we still had a chance, we were playing well, and had to forget about the first 22 minutes. Until that goal from Kalyanin we were still in with a chance, but at 6-4 we were really up against it. We’ll try to play tighter in defense tomorrow. To allow six goals in a play-off game, plus another into an empty net, is a heck of a lot. This victory from the Riga men does not look so sensational in light of the results of games between these two teams in the regular season, with the Latvians winning four out of five. – You cannot say that Riga is an unlucky team for us. Yes, we lost four times in the regular championship, but the problem is that these guys know all about Oleg Znarok, just as he knows all about them. In the end, whoever has the most luck will go through to the next round of the Gagarin Cup. - I think we had the lion’s share of the chances. It was a real play-off match, with special attention paid to guarding our goal. I’m grateful to the guys for the effort they put in. Yes, we slipped up at the end of the third period, but that’s the game, and no-one’s immune to mistakes. We played to our tactical plan very well, and took full advantage in power play in overtime. – We don’t have any strategy. I prefer to look at each game as it comes. You have to play well in every shift, then in every period, and then everything will be fine. Doing things this way, step by step, is the way to build your strategy. – We’ll watch the video and put right our mistakes. – Tomorrow is another day, and we’ll be battling for victory. While Dynamo Moscow left it late, equalizing a mere four and a half minutes before the final siren, Spartak can boast a truly heroic feat, leveling the the score with just three seconds left on the clock. In the end, however, it was all in vain, and the team which had led from the start celebrated a late victory. Branko Radivojevic, scorer of two goals, including that late shocker which put the Petersburg celebrations on hold, could not hide his disappointment. – I’m devastated, of course. On the other hand, we can say we managed to rescue a game just seconds before the siren, but in order to win we needed to be the first to make full use of a power play in overtime. I’m not saying our third goal was the result of a special combination, just that there were six of us and we were able to improvise with the man advantage. From the midway point in the third period our opponents were on the back foot, content just to get the puck away. On the one hand, we had the initiative, but on the other we really had to spend all our energy relentlessly pounding the defense of a team which was already camped on the red line. We came here on a mission to win at least one game. And we were so close. But SKA is an older team, and it will be easier for us to get our strength back for the next game. – It was hard for us to get into the game today, the excitement got to us, so we had to spend a bit more time on the warm-up than usual, and we didn’t launch our first attack until halfway through the first period. Then we found our feet, got our rhythm back, took the lead and were in control until the last half of the third period. Of course, after that second goal we gave encouragement to Jakub [Stepanek]. Maybe we tried to hang on to the lead too early, and Spartak punished us for it. As for my goal, when you’re in the game you improvise more, every moment is unique and you get one chance. I’m happy that we achieved the win and lead the series. That’s the most important figure, not who scored and who assisted. Here the individual performances are not what matters; it’s the performance as a team that’s not after points, but victories. Once again here, the team which dragged the tie into overtime was unable to achieve anything more. The one difference was that the eventual losers had been in the lead earlier in the game. But the most dramatic moment came in the 66th minute, when amidst some mayhem around the Atlant goalmouth the red light beamed behind Konstantin Barulin’s net, signaling a goal. The episode needed not one, but two views of the video replay before the officials finally agreed that the puck had not crossed the line. Another eight minutes of play then elapsed before Jaroslav Obsut’s power play goal finally brought the hosts victory. But the controversy over the disallowed goal raged on, and continued at the press conference. – I don’t know which cameras showed it and which didn’t show that crucial moment with the disallowed goal. But what was the official behind the goal doing lighting the red lamp? You can say what you like, but if the red light is on, it’s a goal! – I’ve seen it many times when the puck hits the pipes and the official behind the goal, by delayed action, gives it the red light. It’s not criminal, it’s just the human factor.